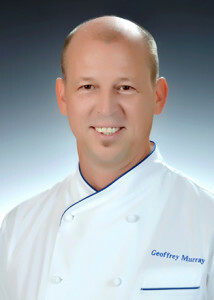 FORT LAUDERDALE, FL – Geoffrey Murray is Executive Chef for The World, the largest privately owned residential yacht on earth. Chef Murray’s primary responsibilities include the management of all galley operations including provisions, inventory control, public health, quality control for the Ship’s six restaurants, and ensuring that The World’s high standards are maintained. He also oversees In-Residence Dining and a staff of more than 50. Chef Murray has an extensive culinary background and experience. Prior to joining The World he served as Executive Chef, Hotel & Restaurants for the five-star, luxury boutique property the Conrad Pezula Resort Hotel & Spa in Knysna, South Africa (S.A.). He began working there in 2005, and during his tenure its Zachary’s Restaurant received numerous awards including: three stars, the highest possible, in the Rossouw’s Restaurant Guide to South African restaurants, an American Express Platinum Fine Dining Award, a Diners Club International Diamond Award and Wine Spectator’s Award of Excellence in recognition of an outstanding wine list. He also worked as Executive Chef / Deputy General Manager at North Island in the Seychelles, did menu development / consulting at the Blues Café in Cape Town and Le Petit Café in Johannesburg and was the Consulting Executive Chef at the five-star Makalali Private Game Reserve in Hoedsprurit, N. Province, S.A. Chef Murray’s hands-on experience includes having worked in restaurants in Paris, Madrid, Mexico City, Long Island, Southern California, Miami Beach, Aspen, and New York City. His versatility in the kitchen includes styles like farm to table, modern ethnic, local organic and globally influenced. Chef Murray’s repertoire comprises a wide range of cuisines such as French, Italian, African, Latin American, modern Creole Seychelloise, Caribbean, Pacific Rim, Californian, American, and Continental to name a few. Born in Rome, New York, he currently lives in Knysna, South Africa and speaks English, French and some Spanish. In his free time he enjoys traveling, outdoor sports and painting. Launched in 2002, The World® is the largest privately owned, residential yacht on earth with 165 luxury Residences. A diverse group of Residents from over 19 countries reside onboard and share interests in world cultures, history and adventure, and exploring fascinating destinations. They circumnavigate the globe every two to three years following an extraordinary journey that they select. In-depth expeditions and one-of-a kind experiences are complemented by world-class amenities and impeccable service. To learn more about this unique lifestyle, call (954) 538-8449 or visit www.aboardtheworld.com.